Drag Racing is an addictive game that has gained a large base of devoted Android gamers over its short lifespan. This says something about the quality of the game and on a personal note I can vouch for the addiction factor. Although not a sparkling 3D game to show off the power of your handset, Drag Racing for Android has solid gameplay that will keep you longing for more cash to upgrade or buy a new car. Let's see how to properly progress in the game to become the ultimate drag racer! Just like most racer games the overall aim in Drag Racing is to progress through various levels, defeating competitors of various strengths, which will let you upgrade your car and increase its value. The drag races are either a quarter or half a mile in length, which both require different strategies to finish. 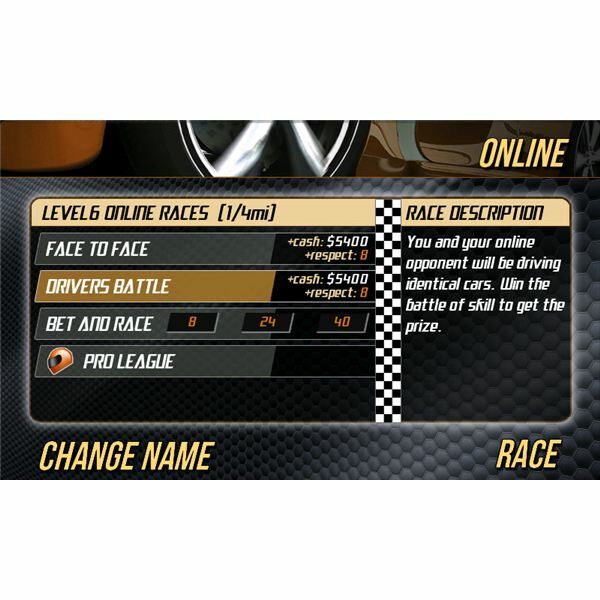 The game also has an online option where users can compete in their own cars, equal cars, bet on a race or compete in the ‘Pro League’. Besides cash, users can earn respect points, which will reflect their ‘street credit’. More importantly, respect points are needed when you reach the higher stages of upgrading. Cash and respect are the key words and make sure you get a lot of both. The game is not necessarily cleverly designed, in that progressing in levels increases the cash and respect you need to invest in upgrades more than the increase in earnings. Therefore it is wise to make sure not too upgrade too much and hang on at a certain level until you build a large enough cash and respect reserve. Without this, the next level will be close to impossible to play. Building up a garage of various cars is not an option if you want to make quick progress. If you feel your car is insufficient for competing in the level, sell it or increase the value and then sell it. This is by far the easiest strategy for getting new cars. Focus on a particular length of track and choose/upgrade your car accordingly. The quarter mile track requires light cars with a lot of grip, while heavier and more powerful cars are most likely to win the half a mile tracks for you. Use the ‘perfect shift’ mostly in higher gears and make sure to shift to second gear as soon as your drag racing vehicle finds good grip. This will give you a considerable advantage, one that opponents will often not overcome. When you arrive in a new level and you are unsure which car to purchase or how far to go with upgrades, just race the boss immediately. Use his car and his race time as an indicator. Regular offline races will only earn you so much money and hardly any respect. Go online to get more of both. If you have a particularly weak car, avoid competing in it online and opt for the ‘Drivers Battle’, which will give you and your opponent random but entirely equal cars. If you get make proper use of the ‘grip-tip’ mentioned before, you should win a considerable amount of races here. Use the cash you earn to upgrade your car and beat the bosses! Using the ‘betting’ feature of online races you can earn a considerable amount of respect. However, you are bound to lose a lot if your car is not in the higher segment of your level. Like with any betting game, confidence is the key with a healthy dose of luck. Therefore, good luck! These tips will get you a long way in Drag Racing but lose a considerable amount of their value if you choose the wrong car. This is the tricky part of the game as some cars are far better than others. Luckily, purchased cars retain their value and it is fairly easy to switch cars around a lot. The mobile game itself advises you to test-drive your new vehicles but my experience is that this will only get you so far. You can never test how it responds to upgrades for instance, which is pretty much the essential part in beating the game. 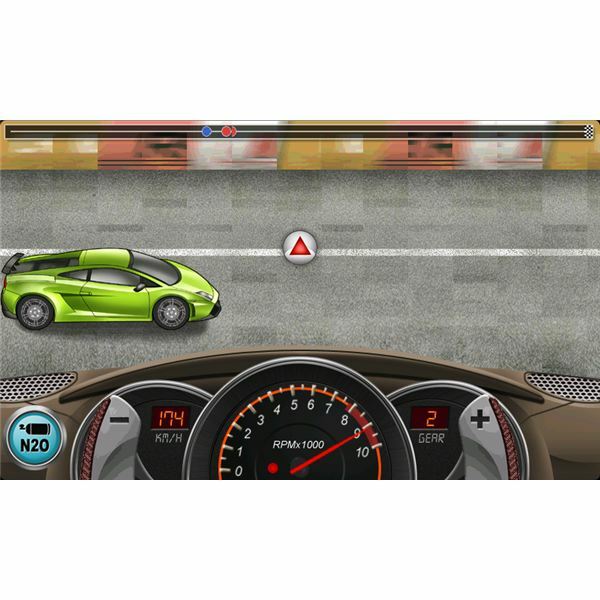 This Drag Racing for Android walkthrough might not guarantee you will be the winner but it should get you well on your way to understanding the basic preconditions for being competitive. See you on the track! Got more Drag Racing tips? Post them in the comment section!